This review first appeared in the January issue of hi-end hifi magazine High Fidelity of Poland. You can also read this review of the Rega Isis Valve in its original Polish version. We publish its English translation in a mutual syndication arrangement with publisher Wojciech Pacula. As is customary for our own reviews, the writer's signature at review's end shows an e-mail address should you have questions or wish to send feedback. All images contained in this review are the property of High Fidelity or Rega - Ed. When I think about Rega the first thing to mind are turntables, then tone arms and finally perhaps CD players and amplifiers. I bet most have similar associations. Others that might also come to mind are British and/or budget hifi. None of it would be a surprise considering that Rega started its activity in the 70s with the Planar turntables. Later their portfolio grew but two things remained unchanged over the years. First off Rega was and remains proud of manufacturing in Great Britain. Secondly and at least until recently they did make budget machines with a very good value/quality ratio. When I first heard rumors that Rega was getting into high-end models I didn't treat those rumors seriously. When Rega released their Osiris integrated amplifier and Isis CD player (the latter in transistor and tube versions) I was truly surprised. The obvious question was whether a manufacturer of mid-class value offerings would prove capable of making real hi-end components? Considering that this was a deliberate choice of company management to support regular rather than just wealthy customers I kept my hopes high. The first reviews I saw were very enthusiastic but given that they came from British magazines which often treat British products with kid’s gloves, I was not quite convinced yet. But I was curious enough so confirmation about a tête à tête with the Isis Valve was great news for me. 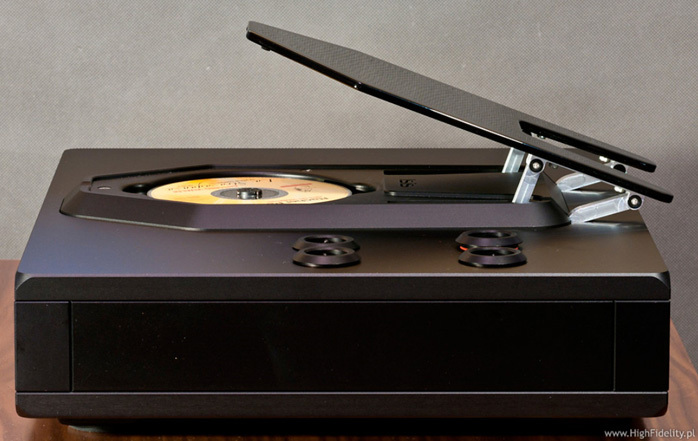 Rega obviously knew that their own long tradition of value kit could become a hurdle for easy customer acceptance and must have decided that it would take more than good sound to get traction and attention. That’s probably why already on cosmetics each and every detail of execution here attempts to convince us that we are dealing with a costly and thus superior machine. I guess that’s valid strategy. I doubt regular Rega customers will rush to dealer show rooms to give this latest gold-plated Rega crop a listen but I’m certain that the core rational behind it was attracting new customers. This player arrives inside a solid wooden case nestled into a shipping carton. Care should be taken unpeeling this crate as it weighs around 30kg, very unexpected for a digital deck. Even outside the box the player still weighs 19kg to be in excess of many ultra expensive one-box machines of its kind. Whilst the Isis occupies a different sphere than anything Rega has done before, in some details it retains familiarity with certain company signature flourishes. Like all previous Rega players, it remains a top loader though its black acrylic lid is quite the upgrade. Other cues recall the Saturn or Apollo, albeit executed far nicer. There’s no mistaking the new Reference series for anything but high-end but sufficient resemblance remains to peg the Isis or Osiris a Rega at first glance. The Isis gets a custom-designed CNC machined aluminium casing with a quality anodized finish. As someone handling many different machines during reviews to cut myself often on sharp edges, I much appreciated all the rounded edges of the Isis. Its front panel looked to be black acrylic with an underlying red LED display. If perhaps not as extraordinary as the one used by Simaudio, this display is of very high quality and surely superior to most the competition. There’s a minimum of mechanical push buttons, just enough to support the basic functions of play, stop, skip forward and backward. The on/off switch tests the user’s ingenuity. I must have failed as I couldn’t find it. Shame on me but I had to check the manual first. Most others would probably find it easily. Just check the photos. It’s that silver vertical strip at the display’s left side. The silver makes it stand out but I still overlooked it. Inspecting the back panel I couldn't help but imagine quite an internal discussion at Rega deliberating how this player should get equipped and how up to date to make it. 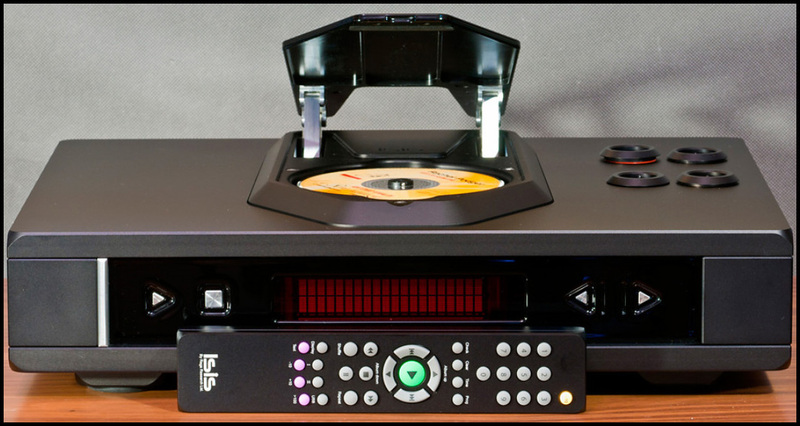 After all, the Isis was released in 2010 when many companies have given up on CD players altogether while stalwarts have added digital inputs including USB or SACD compatibility – something to make their players more attractive on features. How would I know about this? What’s on the back of the Isis are RCA/XLR outputs, coaxial and Toslink digital outputs – and a USB input. Without the latter this would be a regular CD player. By adding a digital input and making it the most fashionable USB, why not other digital inputs as well? That’s why I think there was some kind of internal battle with a half-measure compromise at the end. Personally I’d want it all. On the luxury front, I must mention the heavy metal remote. Only a perennial malcontent like yours truly would add that he’d prefer metal buttons to make it look even better. Sound: Discs used for test - Antonio Vivaldi ,La Stravaganza, Rachel Podger, Arte Dei Suonatori; CCS 19598 ; Cassandra Wilson, New moon daughter, Blue Note; CDP 7243 8 37183 2 0; Cassandra Wilson, Traveling Miles, Blue Note; 7243 8 54123 2 5; Diana Krall, The look of love, Verve; 549 846-2; Dire Straits, Brothers in arms, Warner (Remasters); 9 47773-2; Otis Taylor, Respect the dead, NBM0009; Patricia Barber, Cafe blue, Blue Note / Premonition; 7243 5 21810 2 5; Thelonius Monk, Thelonius Monk Trio, VICJ-41519; Tsuyoshi Yamamoto Trio, Live at the Misty, TBM 2537.